NEW! 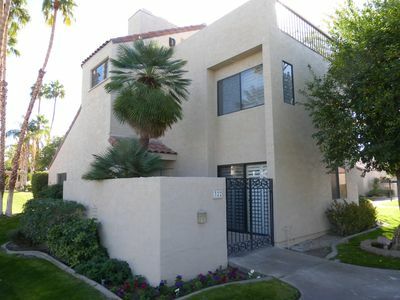 Renovated Rancho Mirage Condo w/Pool Access! 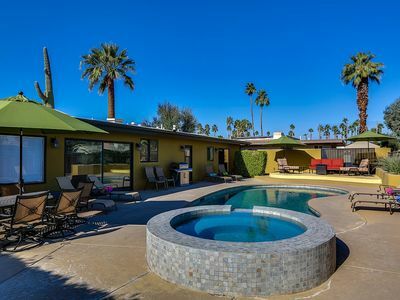 Cut yourself a slice of paradise with a stay at this chic, updated Rancho Mirage condo for 6 just outside of Palm Springs. 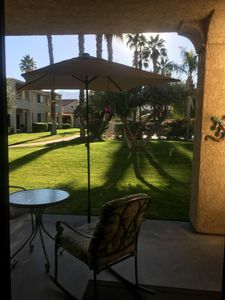 Treat yourself to the lavish amenities of the Rancho Las Palmas Country Club including access to 26 pools, tennis courts and a fitness center, or stay in and grill out on the private patio. 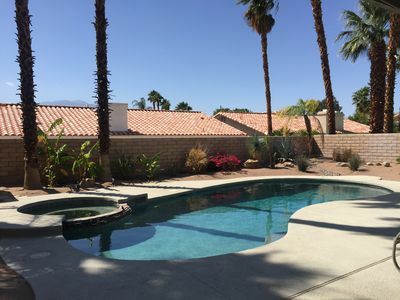 This 3-bed, 2-bath vacation rental is ideally located within walking distance of all the dining and shopping at The River Mall, making it a heavenly home base for your California retreat! 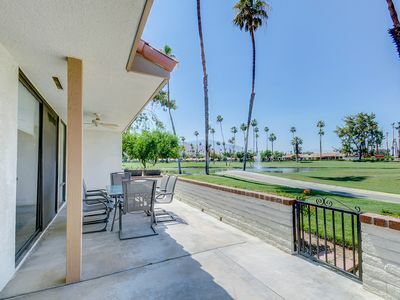 Lofty palm trees and scenic mountain views frame the Rancho Las Palmas Country Club community, where your Californian home-away-from-home awaits! 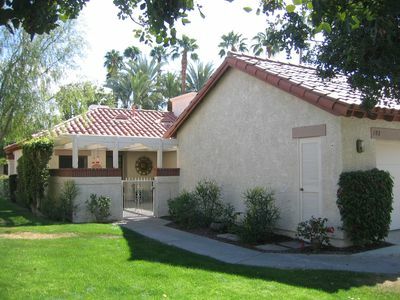 With so many amenities and activities offered right on property, it’ll be tempting to spend all your time at home. 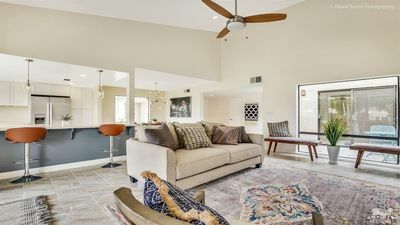 Inside the air-conditioned condo, you'll encounter high ceilings, floor-to-ceiling windows, and 1,600 square feet of modern furnishings and artistic decor. Find yourself a seat on the sectional sofa and flip through a magazine or browse channels on the flat-screen Smart TV with cable. 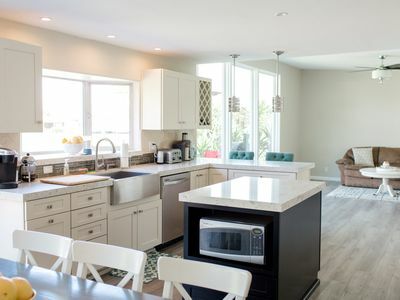 When you're feeling hungry, hop into the fully equipped kitchen to cook up something tasty. 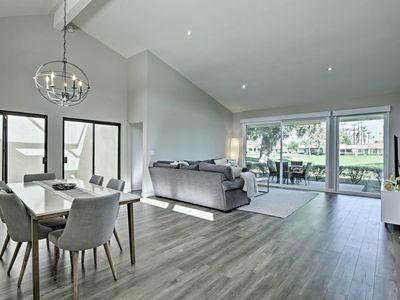 This spacious area allows the entire group to come together and prepare a meal before sitting down at the dining table set for 6. Take advantage of the beautiful California weather and head out to the private furnished patio for a barbecue on the gas grill. 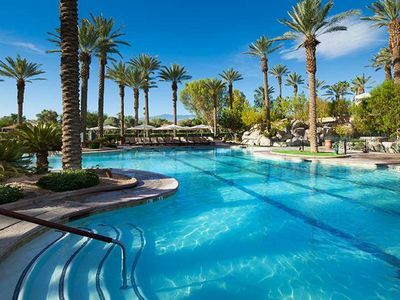 Head over to one of the community's 26 pools for a splash, or tee up on the golf course just outside your door for an additional fee. 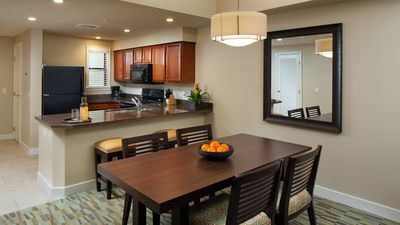 With a gym, tennis court, and clubhouse right on the property, you'll be kept active and entertained during your entire stay! At night, rinse the day away beneath the rain head showers and prepare for bed. 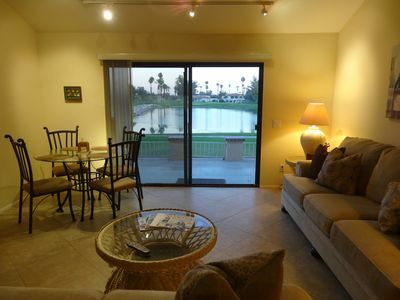 Wind down with your favorite shows on the flat-screen TVs located in two of the 3 bedrooms. 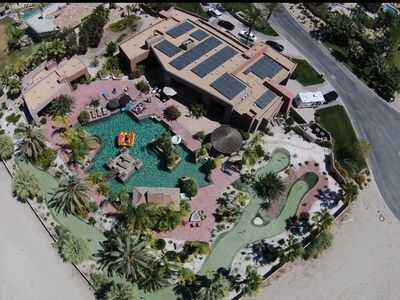 When you aren't taking advantage of all the community amenities, there is plenty to explore in the surrounding Palm Springs area! Just a 3-minute walk across the street will bring you to shops and restaurants at The River Mall, and a 5-minute drive is all it takes to reach high-end shopping at The Gardens on El Paseo. If you like to stay active, grab a bike from Palm Desert Bike Rentals 3 miles away and hop on one of the areas many bike-friendly trails. Explore popular hiking areas such as Cactus to Clouds Trail and Indian Canyons, each less than half an hour from the property. 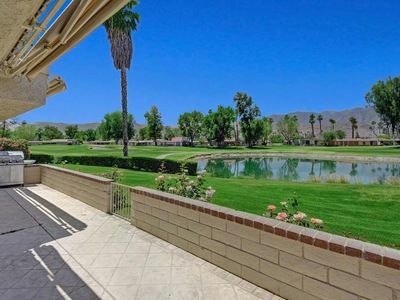 Head into the heart of Palm Springs to experience this Sonoran Desert city, just 11 miles away. 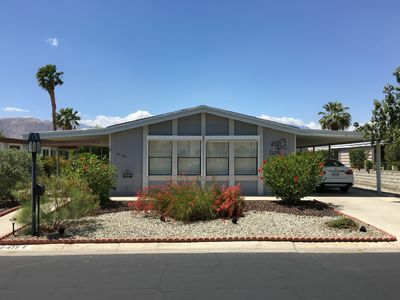 Explore other area attractions such as the Palm Springs Aerial Tramway, The Living Desert Zoo and Gardens, and Palm Springs Art Museum, all within minutes of the property! 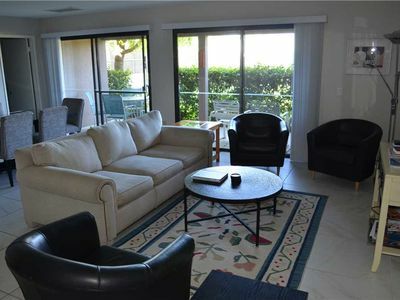 2 bedroom condo, view of pool & mountains, only rent to adults 21 years & older. On the golf course with water views! 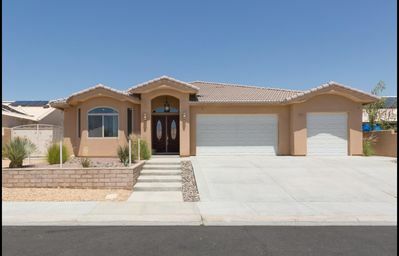 New Listing as of 4/2019! Renovated 2/2! 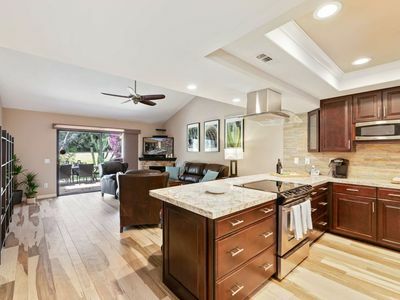 Spacious SW facing back patio! Steps to the pool!